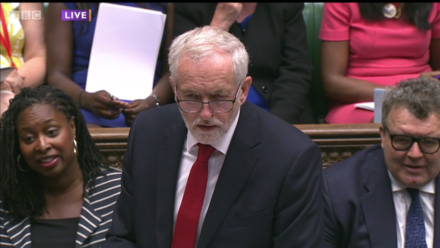 Poor working practices and poverty were the focus for Jeremy Corbyn at prime minister’s questions. And there are few injustices more egregious than the conditions that McDonald’s workers are fighting at the moment – as we covered on LabourList this week. Corbyn’s topics of choice were unifying ones – whereas perhaps a focus on immigration, after the leaked documents which revealed the Home Office’s post-Brexit plans, would not have been so. There are few who disagree that public sector workers are in need of a pay rise, or that people on low wages can face horrible mistreatment. “Warm words don’t pay food bills,” the leader of the opposition quickly reminded May after she tried to flannel her way through a question about nurses’ pay. Corbyn has really developed his ability to shoot back and go off script in his time in the leadership. Now, coupled with his increased confidence after making gains at the election, he often has the upper hand in these exchanges. May’s attack lines were just so tired. But Labour only spends money willy-nilly! Sure, but the Tories chucked £1bn at the DUP to buy their way out of their electoral failures. This was a point Corbyn made – and will continue to be an absolute gift to the opposition every time the Tories try to use their bogus boasts about public spending. The idea that Labour’s spending caused the financial crash is a barefaced lie – and it has worn thin with voters. The shift in opinion on the public sector pay cap is proof enough of this. It might have washed in 2010, but now it certainly doesn’t now, with Britons sick to the back teeth after seven years of austerity. Questions from backbench MPs fitted well into these attacks from Labour’s shadow team. Stoke North MP Ruth Smeeth asked about holiday hunger – which has always been a key concern of hers. May’s response was just so weak, saying that the government is concerned with root causes and not symptoms. That is simply ridiculous – when a symptom of poverty is literally children not having enough to eat, the idea that you shouldn’t concern yourself with that is indefensible and odious. Luciana Berger, Liverpool Wavertree MP and president of Labour Campaign for Mental Health, asked about the case of a minor who was receiving poor mental health care – leading to a judge presiding over the issue to say that the government would have blood on their hands because of their failings. At least she accepted that more needed to be done, even if the Tories have been far too slow to act. One important question came from Heidi Alexander, who asked about extending dangerous driving laws, following the case of a pedestrian who was killed by a cyclist riding an illegal bike. May said that the government will look into the issue – which does indeed sound hopeful. Some stories that could have been strong attack lines from Corbyn did not feature – not least Jacob Rees-Mogg’s comments on equal marriage and abortion rights, and on the leaks surrounding the Tory immigration plans after Brexit. The Labour leader landed far more blows on the government’s record, however, than they managed on that of his party. May’s responses sounded tired – the Tories will need to do better than recycling arguments from 2010 if they are to stand any chance in the next election, which hopefully will come sooner rather than later.